A map of some of Eureka's most dangerous intersections. Click to enlarge. An unidentified bicyclist was hit and killed by a pickup truck yesterday evening at F and Trinity streets in Eureka. According to a Eureka Police Department press release, the cyclist was traveling north on F Street and ran a stop sign and traveled directly into the path of an oncoming 1971 Chevrolet pickup truck that was heading west on Trinity Street. The cyclist, who was not wearing a helmet, suffered major injuries and was later pronounced dead at a local hospital. Officials are still working to notify the bicyclist’s family of his death, after which they will release his name to the public. Last year, Humboldt County roads saw a total of 28 deadly car crashes. 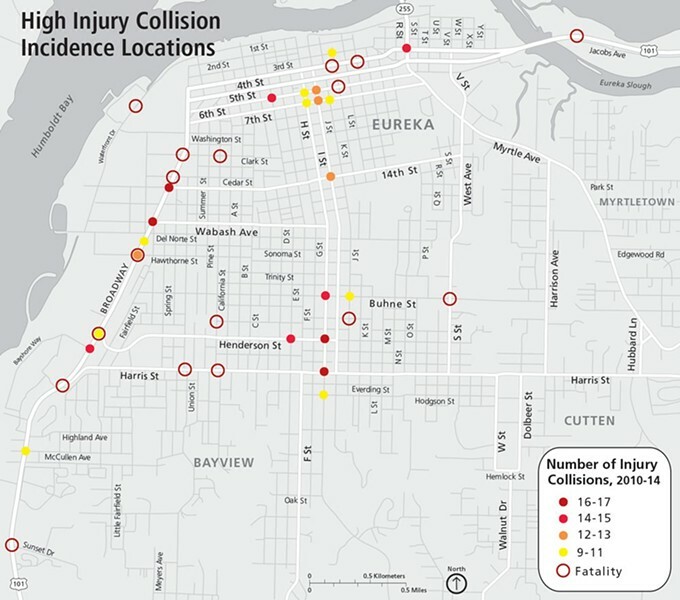 Read more about the countywide problem here, and check out or recent reporting of what Eureka is doing to address some of its most dangerous intersections here. On 01/28/16 at about 5:17 p.m., Officers with the Eureka Police Department responded to F and Trinity Streets in Eureka for the report of an injury traffic collision involving a bicyclist and a vehicle. The bicyclist was transported by ambulance to the hospital, but ultimately succumbed to his injuries. The preliminary investigation indicates that the vehicle, a 1971 Chevrolet pickup, was traveling west on Trinity Street with the right of way. The bicyclist was travelling north on F Street and failed to stop at the posted stop sign. The bicyclist rode into the path of the vehicle and was struck in the intersection. The bicyclist was not wearing a helmet. DUI is not a factor in this collision. The bicyclist’s name will be released by the Coroner’s Office once the next of kin has been notified. This is an ongoing investigation; any witnesses to this collision are asked to call Traffic Officer Tim Jones at (707) 441-4109.